These chipmakers are diversifying their businesses to overcome the Apple headwind. Rumors of weak iPhone sales knocked the wind out of Apple (NASDAQ:AAPL) supplier stocks in 2018. 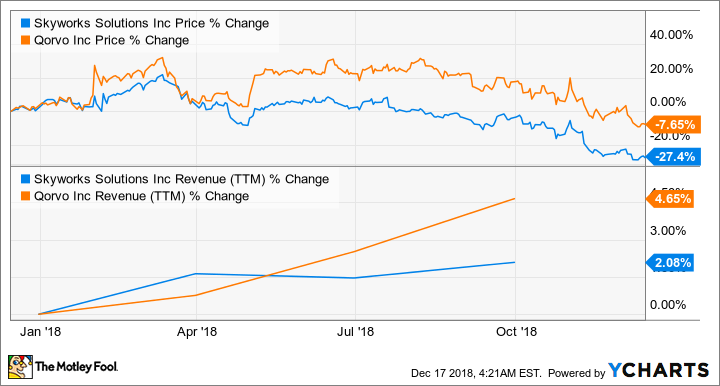 Skyworks Solutions (NASDAQ:SWKS) and Qorvo (NASDAQ:QRVO), for example, have lost ground in the past year, thanks to Apple's weakening grip on the global smartphone market, and it looks like they won't be getting over the tough times anytime soon. Noted Apple analyst Ming-Chi Kuo of TF International Securities recently shared a note (via CNBC) in which he slashed his iPhone shipment estimate for the first quarter of 2019 by 20%. Kuo predicts that Apple will move between 38 million and 42 million devices in the first quarter, as compared to a prior forecast for 47 million to 52 million. For comparison, Apple shipped 52.2 million iPhones in the prior-year period. So, it looks like Skyworks and Qorvo will start 2019 on a bad footing thanks to their reliance on the iPhone maker. Let's see how Apple's tough times could impact these companies, and check whether they are doing enough to diversify their businesses. Skyworks and Qorvo have been able to boost their revenue over the past year as they have been actively looking to grow into secular growth markets such as the Internet of Things. Skyworks, for instance, got 28% of its total revenue from its non-mobile segment (formally known as the "broad markets" business) during the recently reported fiscal fourth quarter. The non-mobile business is now clocking an annualized revenue run rate of $1.1 billion, and it could become much bigger. Skyworks said that revenue from this segment was up by double digits last quarter as compared to the prior-year period. Skyworks said earlier in 2018 that it expects steady mid-teens growth for the broad markets segment. So Skyworks could generate around $1.25 billion in revenue from the broad markets business in the new fiscal year, based on the annualized run rate, assuming that this segment grows 15%. That's probably one of the reasons why analysts expect the company's top line to remain constant in fiscal 2019, despite the fact that it got 47% of its revenue (or $1.81 billion) from Apple in the previous fiscal year. However, Skyworks faces some near-term challenges, as its revenue is expected to decline annually over the next couple of quarters before a potential turnaround arrives in the second half of 2019, when a new iPhone is launched. But looking beyond the iPhone, it is becoming clear that the non-mobile business is the one that's expected to play an important part in the company's growth. Skyworks' revenue is expected to accelerate in 2020 as the clout of its non-mobile business grows, along with additional catalysts such as 5G wireless infrastructure. Patience should pay off for Skyworks investors, because the company is well-placed to handle the Apple-related slowdown. Qorvo is slightly less dependent on Apple for revenue than Skyworks. Cupertino supplied 36% of its top line in fiscal 2018, and Qorvo looked set to make the most of this relationship by winning a chip slot from a rival. But reports of the iPhone XR failing to click with customers washed away Qorvo's newfound catalyst, and the company was forced to slash its guidance for the current quarter. The company projects $820 million in revenue in the quarter that ends in December, down from original guidance of $890 million. Qorvo blamed a "change" in flagship smartphone demand for the lower guidance. News of the massive production cuts at Apple means that Qorvo's performance won't be turning around in early 2019 either. Still, analysts expect Qorvo to deliver nearly 6% top-line growth in the current fiscal year, which ends in March 2019, followed by an identical increase in the following year -- so Wall Street expects the chipmaker to beat the Apple-related slowdown. That doesn't seem surprising, as Qorvo looks all set to take advantage of the growing demand for gallium nitride (GaN), which is deployed in 5G wireless base stations. Qorvo has around a fourth of the GaN market, so it's in a solid position to make money from a space that's expected to grow at 23% annually over the next five years, hitting $1.3 billion in revenue. What's more, the company is sitting on additional catalysts such as the Internet of Things (IoT), where it's engaged in trials with automotive companies to enable connected cars. There's no doubt that the near-term performance of both these companies are taking a hit thanks to their dependence on Apple. However, it's evident that Skyworks and Qorvo have been making efforts to boost their non-Apple businesses. Investors in Skyworks and Qorvo shouldn't panic, as both companies are well-placed to weather any Apple slowdown.